Hello! I’m back today with this card that I made for my son Finley’s birthday last week, which was from my daughter. I struggle with any ‘male’ cards but it’s made easier when they’re into a particular sport or hobby – like Finley – who loves his footy! For this one there was no colouring involved as this is a topper from Kenny K, so I just teamed it up with some nice bright papers and that was that really! I created the sentiments on the computer and used Spellbinders Square, Star and Banner Dies. I also used black Kanban cardstock, blue paper from stash and Spots and Stripes papers by Papermania. 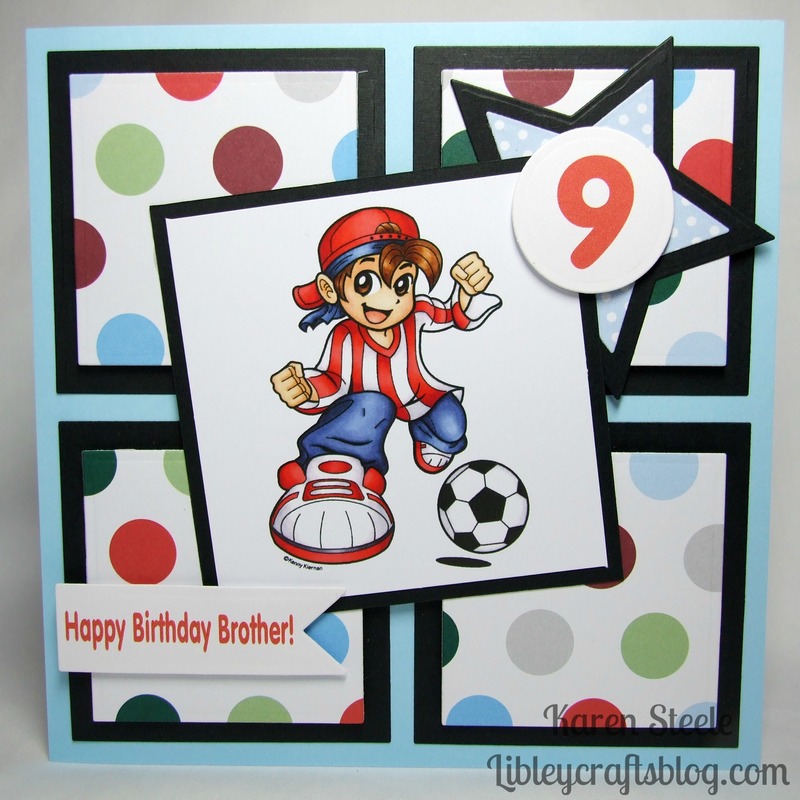 Amazing sport card for a young boy! Love the image and design, Karen!! Another fab card, Karen. You do ‘bright and cheerful’ so well! Super cute, Karen! Love the pattern papers you used with this adorable image! Great boy design! Also this is perfect for a little boy. Fun image and colors ! Well how awesome is it that you didn’t even have to color him!! Perfect card for a boy!! You put it all together perfectly, Karen!